and Jim Sutton were honored for their efforts to train people to work in the transportation industry. Earlier this month, Workforce Initiative Now recognized Gilmore Construction Co. and four Regional Transportation District asset management employees who are mentoring apprentices seeking careers in transportation and construction. Honorees received WIN’s Winners Circle Award at RTD’s Sept. 24 Disadvantaged Business Enterprise and Small Business Enterprise (DBE/SBE) meeting in Denver. “We are indebted to our partners for all they do for program participants trying to break into the job market or into new careers,” said WIN Manager Martell Dyles. RTD employees who received recognition included Asset Management Manager Jim Sutton; Safety, Security and Facilities Inspector Chris Harmon; Asset Management System Administrator Lou Cripps; and State of Good Repair Supervisor Luke Westlund. Gilmore Construction founders Jake and Vince Gilmore also received the award for years of community service and its partnership with WIN. Harmon is widely credited with leading his department’s training partnership with WIN. This year, four top students from Community College of Denver and Emily Griffith Opportunity School have been accepted into the Asset Management “Exposureship” Program. 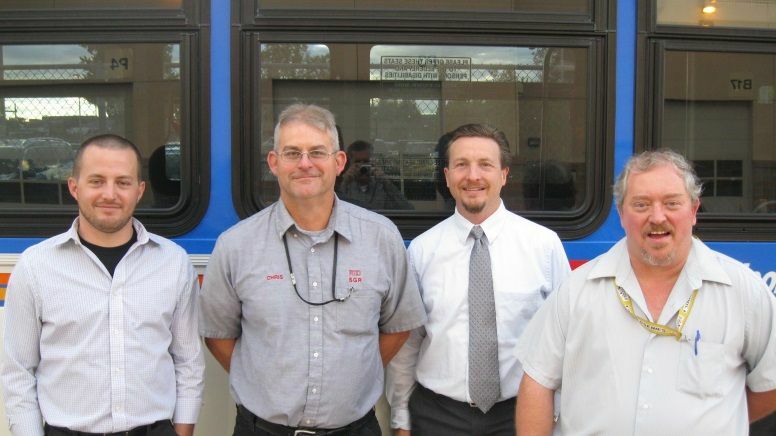 They are shadowing RTD employees at bus and light rail facilities across the district to learn a myriad of job skills. Students train for “mechanic helper” positions, which can later lead to general repair mechanic positions at RTD. The program is modeled after similar apprenticeships implemented by the U.S. aviation industry and by the London Underground. This training/entry-level/skilled trade job career path is a logical, linear, and most importantly, repeatable process for anyone willing to dedicate themselves to a specific path,” said Harmon, who was inspired to create the program by his military basic training. Harmon, Sutton, Cripps and Westlund were humbled to be recognized for their collaboration with WIN and its participants. Meanwhile, Gilmore Construction received the award for its community involvement and support of workforce training. Founders Jake Gilmore, operations manager, and Vince Gilmore, a field engineer, have worked on several RTD construction projects. After achieving professional success, the brothers set out to help others get their foot in the door – including WIN participants – to give back to the community.